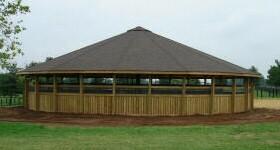 Quality Craftsmanship and Turnkey installations available. Billy Estes Construction will build the concrete pad, fences, drainage system and/or optional roofing systems anywhere in the United States. 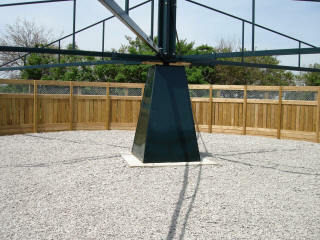 The 6’x 6’ concrete pad for the base of the machine has anchor bolts and a ground rod for the electric fence system. 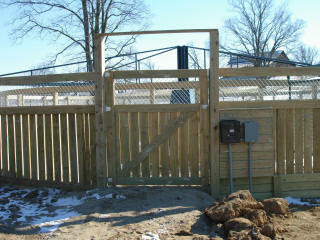 Conduit from the center of the pad to the outside of the outside fence for the control box. 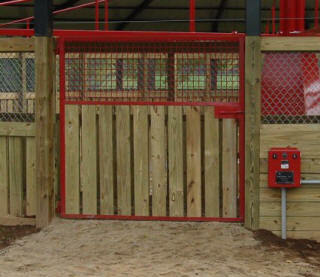 Fences are built on site using 6”x 6” treated posts set in concrete for the outside fence and 4”x 4” treated posts set in concrete for the inside fence. 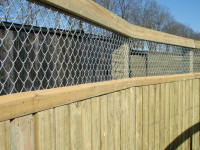 9 gauge chain link is used for the top 2’ of the fences with trim boards on the inside for a smooth finish. The standard vertical 2”x 6” treated boards have an airspace between each one. All the boards are securely attached to the posts with screws, no nails are used. A French Drain system is installed for drainage in the exercising area using a woven geo cloth on the graded pad, then a layer of 6” to 8”of compacted rock on the geo cloth with a layer of felt geo cloth on top of the rock. The final training surface is placed on top of the felt geo cloth providing an all weather surface for your horses. 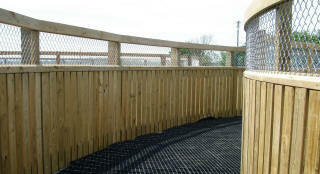 Optional Stable Grid can be installed to keep your surface from trenching out over time, see the Stable Grid page. Optional rock layered onto plastic sheeting to keep the inside of the exerciser clean and weed free. Strong outside banking boards to hold the training surface banking in place. Using Stable Grid under the exercising surface will keep the training surface from trenching into the French drain area. 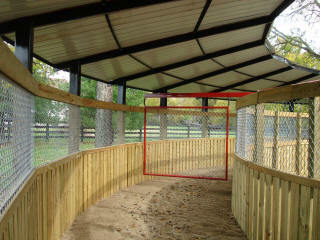 Inside the training area is built to be smooth assuring that the horses will exercise safely. The vertical boards allow for good airflow and the banking boards will hold your training surface in place. 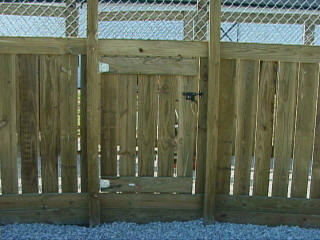 Optional 6’ tall Chain Link fence design can be substituted for the wood and wire fence design above. 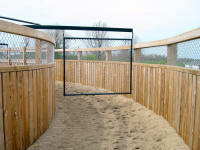 A combination of both fence designs can also be used. 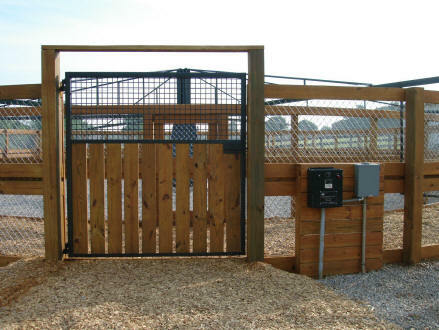 This Chain Link fence design uses both 2”x 6” and 5-1/4” treated boards placed horizontally around both the inside and outside fences for kick boards, it also serves to keep the chain link solidly in place. All the wood is screwed together, not nailed. 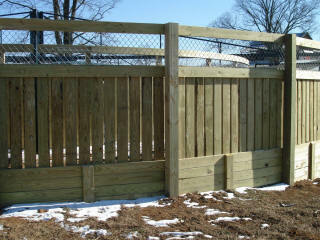 The post sizes are the same as for the wood and wire fence design.